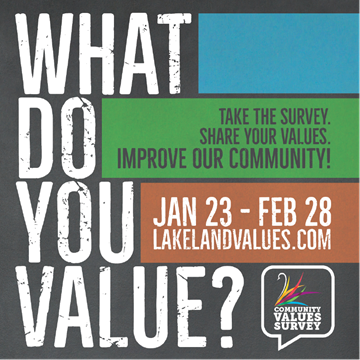 Thank you for visiting Lakelandvalues.com! Unfortunately the window to take this year’s Community Values Survey has ended. We will be working to compile the responses and will post the information on this website, as well as the City’s website www.lakelandgov.net soon after the results have been directly communicated to the City Commissioners at their Strategic Planning Workshop this spring.